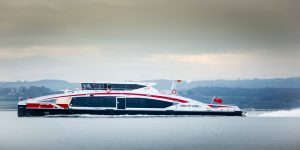 Wight Shipyard Co delivered its first multi-million pound export order for a 250-passenger river catamaran to operate for Central Danube Region Marketing & Development GmbH’s Twin City Liner – a tourist service running on the River Danube between Vienna and Bratislava, joining two European capital cities. The 39m vessel is excellent news for the Isle of Wight shipyard and follows an exceedingly productive 2018. With other successful deliveries to Red Funnel for a second 41m high speed passenger ferry, followed swiftly after with Scotland’s Jacobite Cruises 21m day cruise catamaran for Loch Ness. “Twin City Liner in Vienna, our first export order, follows domestic orders for Red Funnel and MBNA Thames Clippers, both of which we secured against international competition”, says Wight Shipyard CEO Peter Morton. “Our reputation for building the finest high speed ferries in the world is spreading, making the prospects for Wight Shipyard look healthy. Our strong order book is a big vote of confidence for our Isle of Wight shipwrights, the marine industry and indeed the UK economy”, Mr Morton says. The new vessel is a low wash round bilge catamaran designed by Incat Crowther. The Danube presents a challenging operating environment with currents up to 8 knots, water depths in the main navigation channel as low as 100cm. The hullform is designed to cope with water conditions reasonably expected on the river, being able to resist floating timber and debris. As a restricted waterway it is imperative that wave wash is minimised. The vessel is powered by four Scania DI16 072M main engines, each producing 809kW at 2300rpm. Capable of reaching a maximum speed of 38 knots, the vessel will sail on the Danube at a service speed of 32.4 knots at modest MCR. “Since 2006 Central Danube Region Marketing & Development GmbH has been operating successfully with more than 148,000 passengers experiencing the service between Vienna and Bratislava each year using two high speed catamarans”, says Dr Gerd Krämer, Managing Director of Twin City Liner. “With this new vessel, we will cater for projected traffic growth, achieve much better operating economies of scale, greatly reduce our environmental footprint and at the same time be able to offer a comfortable and exciting high-speed transit along this beautiful waterway”, Mr Krämer adds.